Although it could appear as a Wertmuller site or page, it isn’t! 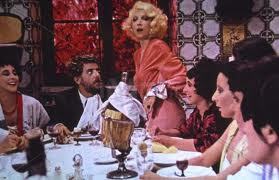 “Tutto a Posto e Niente in Ordine” is a cine-forum about Wertmuller’s movies and about her collaboration with Mariangela Melato and Giancarlo Giannini. Using her cinema, we want to focus the people attention on some social and political problems of the italian society of nowadays. A post, I should say – the first with her in it…believe it or not. This article provids clear idea in favopr of the new viewers of blogging, that really how tto do blogging and site-building.